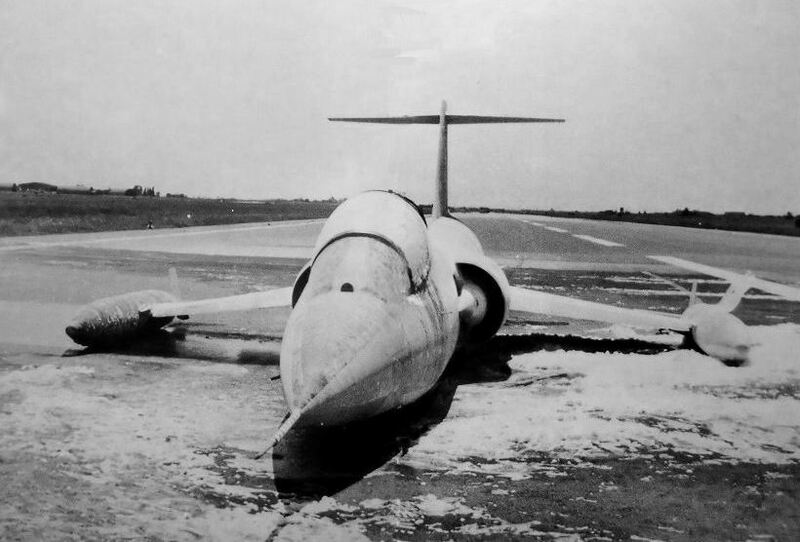 This day an unidentified F-104 made an emergency landing at CCK. The pilot ok being Lt of Capt Ying. Aircraft caught fire, landing gear could not be lowered and so the landing was made on its belly. The drag chute was used but was damaged due to the strong wind. Sadly this aircraft has not been indentified sofar. This Starfighter encountered an accident damaging its right mainwheel and sustained cat-3 damage. 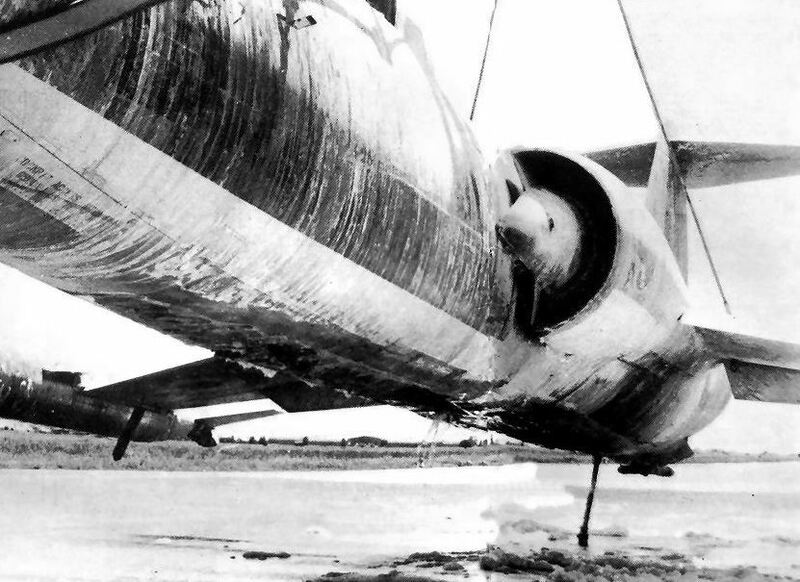 It was seen with 3CM at Villafranca with this damage till August 1987. There it should have been repaired but it never flew again. It had 3039 hours flown and was withdrawn from use. It crashed while landing at Balikesir Air Base. Pilot 1stLt Kemal Uyguntürk (26) was sadly killed. The landing was controlled by GCA because of very low visibility circumstances. It crashed near Ayia Mavra (Hellenic: Agia Mavra Andravidas) during a trainingflight. Gladly pilot Capt Theodoros Bekos ejected safely. The cause of the accident is unknown. Beneath a photo of this Starfighter taxying in better days. This month this Starfighter encountered an accident but could be repaired soon. Pilot was ok. 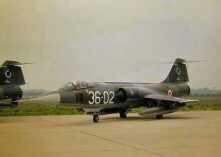 Beneath a photo taken of this Starfighter taken end 1986. It crashed a few months later. 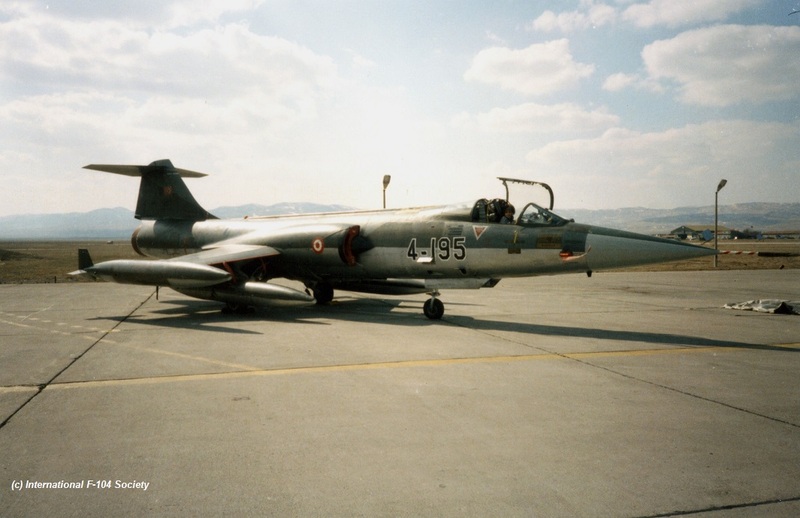 This starfighter was written off after a crash near or at Diyarbakir for an unknown reason. The pilot was ok. 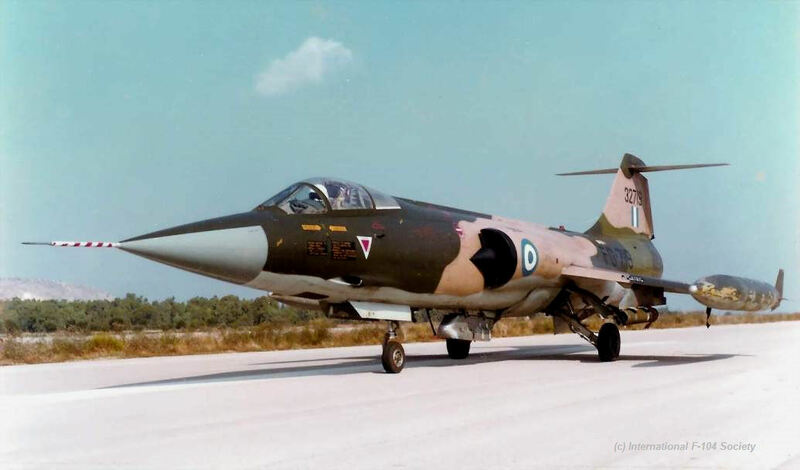 This starfighter crashed near Murted AFB and the town Sivrihisar. Sadly both pilots were killed being Hv. Plt. Ütgm Ercan Kaya (29 years old) and Hv. Plt. Yzb. Selim Kurt (32 years old). The cause of the accident is unknown. 14 February 1987 F-104 unknown 2TFW RoCAF written off pilot ? This day an unknown Tai Chung based Starfighter was lost. 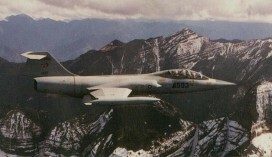 After an intercept training, while returning to base, entered TACAN course over Da An River mouth, the pilot declared something was wrong with the aircraft. He changed his flying direction to a waypoint south of Peng Hu Islands, re-entered TACAN course, prepared to descend, and suddenly disappeared. He was likely killed in the accident. We have no information about the identity of this Starfighter yet. (USAF serial 63-13253) This day this aircraft made an aborted take-off and while it stopped at BAK-12 the aircraft caught fire and was severely burnt and written off. Pilot Mong Hsien Kuen could exit the aircraft and was save. 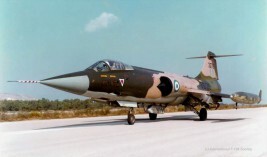 This starfighter crashed near Meligala, Messinia due to an unknown cause. Gladly both pilots, Nikolaos Fifas and 1st Lt Elias Apostolopoulos ejected safely. This was the 2nd ejection for Apostolopoulos in 2 years (he also ejected from TF-104G 5736 in 1985). Cause unknown. This two seater Starfighter crashed near or at homebase Murted. Pilot Hv. Plt. Ucb. Kd. Bcvs. Kadri Cakmakyapan (38 years old) was sadly killed in this accident. If there was a second pilot on board then that pilot was safe but it looks like their was only 1 pilot on board during this flight. The cause of the accident is unknown. 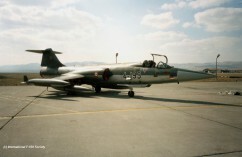 This starfighter was written off due to an engine failure at or near homebase Diyarbakir. Gladly the pilot survived the accident. An unidentified Starfighter crashed at Pu Yan, Chang Hua. Gladly Capt Chen could be recovered after ejection. 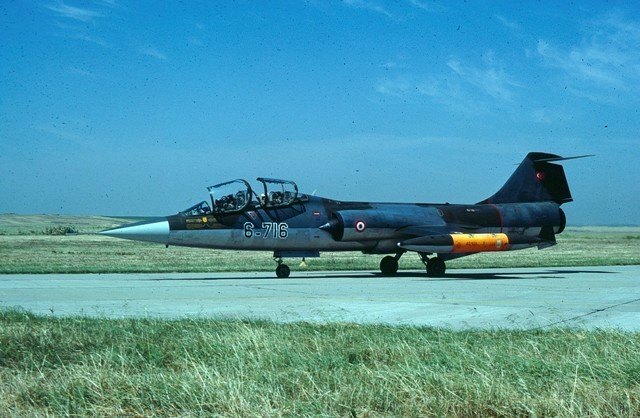 Some believe this was F-104G 4317 but this has not yet been confirmed. The cause of the accident is unknown. (FMS unknown) This Starfighter crashed during its delivery flight to CCK this day, after being assembled from Pingtung. Pilot Lo Ji Hsun ejected safely. The aircraft came down in PuYen village on a farm in Zhang Hua County. The cause of this accident was a flame-out (compressor stall). 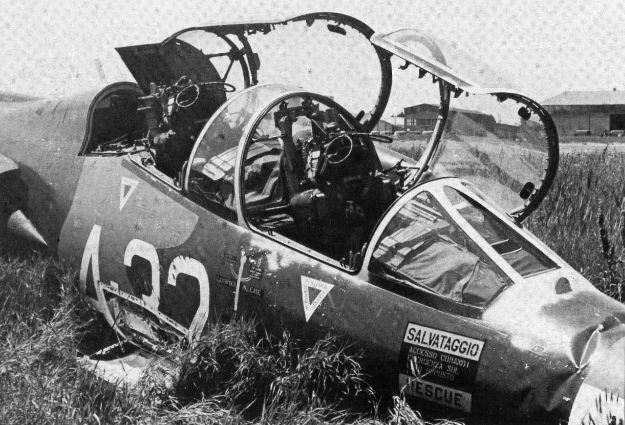 The pilot who ejected from the 4520 became a Wing Commander mod 2000s. A witness stated that people in that area rushed to the crash site to see if God had shown any hint of the Lottery numbers. This aircraft was meant for 7TFS at CCK 3Wing. 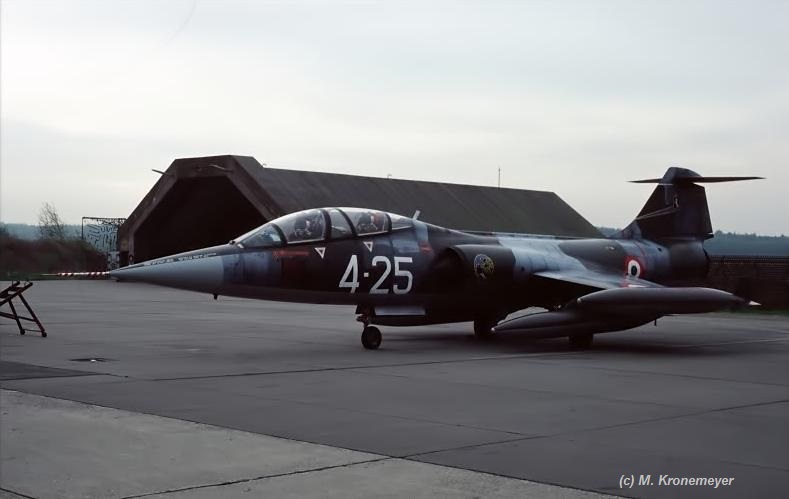 Since there are no photos known of this aircraft its construction number is unknown but could most likely be FMS 36-8525 or 36-8555. Who can confirm? 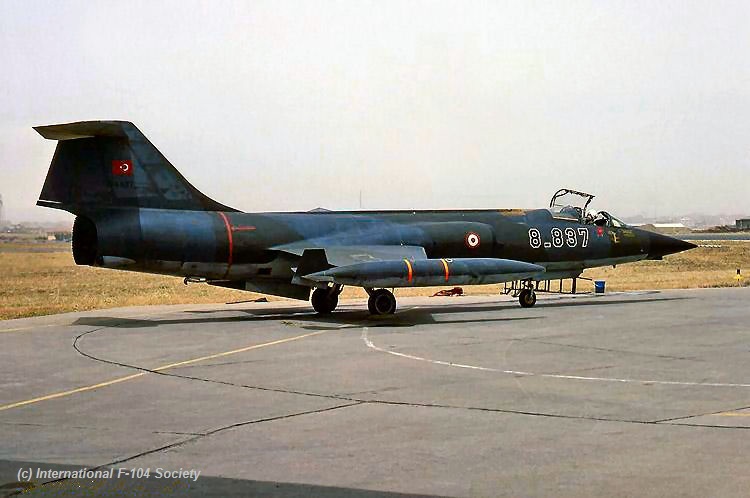 This starfighter was written off due to an engine-failure near or at homebase Diyarbakir. Gladly the pilot was ok. It crashed into sea (after hitting the water) near the gunnery range of Sardinie near Deci (near al largo di Capo Frasca). during a 2x2 DACT mission over the sea. Pilot S.Ten. Alessandro Ferrarese (23) was sadly killed after first reported missing. It happened not long after take off from Decimomannu Air Base at around 11:38h local time. Beneath a photo of this aircraft back in 1983. (FMS serial 26-5006) This aircraft made a successful emergency-landing at Chia Yi Air Base, due to a compressor stall. In October 1987 it was seen already again operational at CCK. Both pilots were OK. YING Jia Sheng and XU Zhu Jun. It was Ying’s second accident. Investigation showed that 2/3 turbine blades were damaged. It happened during a test flight. Beneath a photo of the aircraft wearing markings of CCK based 7TFS. It crashed at or near homebase Bandirma due to an unknown cause. The pilot was ok. It crashed near Afyon due to unknown reason. Pilot was ok. It was damaged during a landing accident. Its nose and radome were severely damaged and bend. The pilots were ok. In September 1987 the aircraft was seen at Caselle (Alenia) undergoing repair. Soon it flew again. (USAF serial 63-8464) It crashed in landing at Taoyuan AFB. Pilots Liu Huan-Tsan and Jian San-Min ejected but sadly were killed. The aircraft could not land at homebase Xin Zhu AB (Hsinchu), because of bad weather, and diverted to Tao Yuan AB. About 07:00h the pilots took the old runway instead of main runway (misidentifying runway 05 and the taxiway), failed to correct landing, and crashed into hardened aircraft shelter in-between. (USAF serial 63-13690) It crashed into sea, one NM from Ao Hua Village or Nan Ao Town, I Lan County, after a technical malfunction. The pilot, Bu Chi-Fang (27) ejected and was photographed in the air by passing student. When helicopter arrived they only saw an overturned liftboat (dinghy). After missing and not recovered for six months, the pilot was officially declared killed. It crashed a few minutes after take-off, at Orkana Kissavou, near Larissa sadly killing the pilot 1st Lt Stavros Zografos. It happened in bad weather. It crashed near Manyas-Gol due to unknown reason. The Pilot Hv. Plt. Kur. Bnb. Salih Gunucu (37) and Hv. Plt. Ütgm. Halim Kankale were both sadly killed in this accident. Beneath a photo showing the aircraft taxying at Bandirma AB. It crashed near or at homebase Murted. Pilot was ok. The cause of the accident is still unknown. 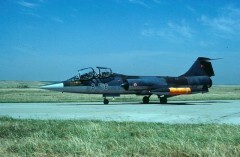 Photos of this aircraft in Turkey are quite rare, here a photo taken at Murted, taken in 1987.